Short Description DJ type music player with X-fading and effects. 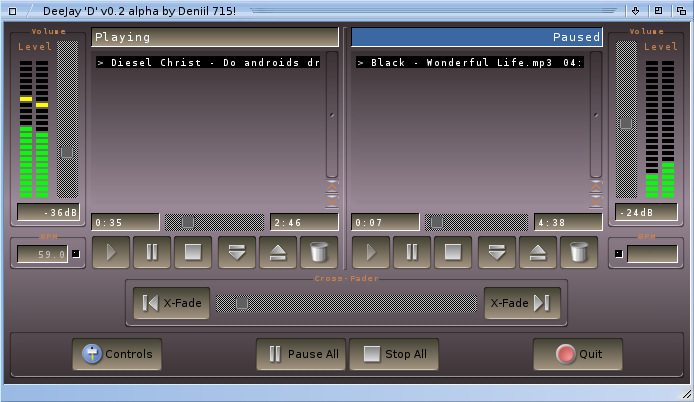 - Full drag'n'drop support of tracks in the playlists and from Workbench. - Automatic and manual cross-fading between songs in opposite playlists. - Gapless transitions to the next track with configurable fad-over. - Silence skipping at the beginning and at the end of tracks to improve the gaplessness. - Compressor effect for a more dense and loud experience. - Dynamic Normalizer to level out the volume in and between tracks with unequal recording levels.